He stared at the phone in his left hand. Cradled it, imagined it as sand flowing through his fingers. Cradled it like a downed kite on a blustery day at some beach in the Hamptons or Cape Cod. From his left hand came the voice of a mid-western lady. His hand returned to the sound of elevator music. He dreamt of sleep. Blue and endless. Like an airplane following the sun an hour after its bedtime. He followed too. His body ached for no reason in particular. He was a healthy man. Right now he had a cold, but that didn’t matter. What mattered was the fact that he could barely get up in the mornings. He wanted to sleep all day. All day every day. He went inside. Placed the phone gently beside the sink. Looked in the mirror. Wet his hands. Rubbed them against his face. Splashing water on his neck. Look back in the mirror. Watch the water cling to his mustache and beard. The tiny scab below his eye that always made him look hung-over. He went over to the towel rack, dried his face. His phone on speaker phone. He did this multiple times throughout the day. He worked from home. Making calls. Doesn’t matter what or why or when or who he made the calls to. Suffice it to say that it was boring, mindless, abstract work, and it made him think often of Marx’s concept of the abstraction of labor and it also made him think often of modern, electrical, mechanical man, and it washed over him for hours on end these thoughts, about why or how life became this way and was it the best way to be and were we better of with bows and arrows and so on, indefinitely, repeatedly until he went home and took some Nyquil and fell asleep in front of the moving picture box writing a short story about a man very much like himself who was tired and depressed and addicted to cold medicine (at least today), and who couldn’t think of much else to write about besides a man on hold with a telephone operator as a metaphor for sterile modern living. There’s a taut and well-written screenplay by Chris Terrio based on the book by Tony Mendez (Affleck’s character in the movie). Argo so far has won for best screenplay and Best Picture at the Golden Globes. Similar to Zero Dark Thirty in the sort of historical narrative it portrays, the film deals less with moral and social ambiguity of ZDT and instead focuses on the fascinating and terrific plot of an improbable rescue mission. Affleck weaves real footage of historical events with his film and paces the film perfectly—from the frightening opening moments of an embassy overrun to the nail biting conclusion. I thought both The Town and Gone Baby Gone were terrific, but this is his best movie yet. Affleck portrays a moment in history which, to be honest, I’m not sure how didn’t lead to a war. It almost feels as if you’re watching the backstory to the modern day wars and conflicts we find ourselves engaged in today. Though the movie does not dwell on the issue for long, the fact that the U.S. and Great Britain organized a coup to reinstall a hated dictator seems to be the beginning of a now tense and complicated mess of U.S.-Middle East relations. Though the movie tells the story if events that happened thirty years ago, it ends up feeling like a modern day drama. What surprised me most about the story was how peaceful everything resolves. It’s hard not to believe that if the same thing happened today, World War III would be at our doorstep. This is perhaps what makes the storyline of Argo so good. Improbably actions that actually end up working. I wasn’t alive in the seventies but it seems to me it would be an easy choice to give back the Shah in exchange for over 50 American lives—but somehow six American escaped through a plot so crazy it had to be a movie, and the rest were eventually released unharmed. I’m in the process of making my way through as many of the Oscar nominated movies I can. I’m usually only 50% impressed with which films end up winning and which ones don’t even make the list, but then again I like really weird films. However, last night I watched Zero Dark Thirty. I wasn’t expecting much to be honest. When I first heard they were making a film about the death of Osama Bin Laden, I assumed it was a cheap Hollywood race to rake in money over a major historical event, akin to Act of Valor. I left my house at 8:45 to walk to the Gateway and meet my friends Joel, Jeremy, Matt, and Justin. Joel and Jeremy used to be in the military, but now have sort of a hippie ex-pat vibe going, though you know that either one of them could crush your skull if they so desired. When the five of us left the film, I felt as if my entire moral compass had been spun on it’s head. It was the most morally confusing film that I’ve seen in a long time. On the one hand, you want to see the dramatic unfolding of the hunt for perhaps the the most infamous terrorist our world has seen. You’re kinda of excited to see him get taken out by an elite group of bad-asses. On the other hand, there’s the inevitable series of events that has to occur in order for Bin Laden to be captured. Mainly, torture. People getting water boarded and led around naked on dog collars. Director Kathryn Bigelow does a terrific job however, of letting the story unfold before us, not letting her commentary on either torture or Al Queda to get in the way of the bigger themes of the film. Since I am a Christian with no particular ties to any one nation, I wasn’t going to sit there and chant U.S.A.! in the theater when Bin Laden finally died. But I was kinda of excited. I felt bad that I was excited because as a Christian I’m told to love my enemies, but it also felt like an act of justice. On the other hand, I’m not the biggest fan of empires and part of me kinda felt like rooting for the “bad guys.” The fact that certain operatives could evade capture from the most powerful and technological military the earth has ever seen for as many years as they did, is fairly impressive. It’s a little bit like the underdog kicking the bully in the junk. Basically, at one point I was rooting for the underdogs, and then I wanted all to be a Navy Seal and get Terminator on some terrorists. I’m a very confused man right now. I didn’t like how happy I was to see a person die, albeit, a very horrible person. But on the other hand, maybe it was okay, maybe it was justice. I didn’t like the fact the Bigelow actually made me re-examine my beliefs in pacifism and militarism, but then again I think that’s why it’s such a great film. 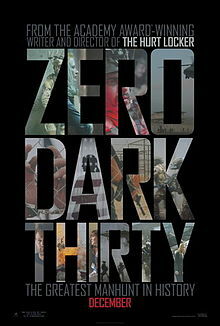 Zero Dark Thirty begins and ends with a heavy sort of silence. An appropriate way to bookend the questions it raises.